It’s the end of 2013, and as a go-to source for everyday online discoveries, Soundcloud still remains unmatched. We’ve cobbled together our favourite tracks from this year that are available on the platform and put them in a handy list for your listening convenience. They’re picked from a variety of genres; some are relatively famous where others are obscure. Some are off the year’s standout albums while others are one-off greats. All, we think you’ll agree, are intrinsically special. Curating great music for you, after all, is what we here at Creation 5 are best at. It’s impressive how utterly Brit producer Tourist. has reinterpreted all-girl sibling trio Haim’s pop rock jaunt ‘The Wire‘. To transform it into an earnest dance-worthy mix, he’s pressed a bare percussive skeleton through longing vocal trails, bringing it all together over a spirited backbeat. The result, as you’ll see for yourself, is both imaginative and downright addictive. Montreal shoegaze duo No Joy have had a great year, musically. Their November EP ‘Pastels And Pass Out’ starred this track as lead single, and for good reason. It’s unclear whether ‘Last Boss’ was inspired by the Mario videogame series – but while you’re floating through thick guitar haze on the lost voice of singer Jasamine White-Gluz, it seems quite irrelevant. This is music to daydream to. New Delhi producer Frame/Frame released his debut EP this year, and it featured his first truly arresting music – ‘Pastels’, combined with one of those rare videos that does justice to its source material, was easily one of the catchiest songs we’ve been hooked to all year. Find out why. French techno producer Gesaffelstein released his debut LP this year, and teamed up with Fleur and Manu to create a masterful video for this evil, throbbing track. Feature ‘Pursuit’ on any dance mix to create an instant party centered around its ritualistic bassline. James Murphy of LCD Soundsystem has been in the news lately for producing the last Arcade Fire album, but his remix of David Bowie’s ‘Love Is Lost’ was his year’s true high point, rebuilt around the sound of hands clapping in a mammoth ten-minute masterpiece that has to be experienced to be believed. Four Tet, one of the largest names in British electronica today, dropped a massive rarities mix 0181 earlier in 2013 that was a definite winner. This track, however, is the stunning lead single off his newest album Beautiful Rewind. The ethereal female loop that is deftly rewound over throughout the track is the real hero here, though Four Tet’s flawless production helps cement it as a playlist staple. This lead single off Engravings, arguably one of the top albums of the year, is a glorious distortion of strings, booming foghorns and jittery guitar-work. ‘The Weight Of Gold’ (and indeed this entire haunting LP), deserves to have its depths plumbed over and over. Tune in and no doubt you will be forced to oblige. In a career best moment, German veteran Apparat released his most astonishing album yet, Krieg Und Frieden, this year. It’s tough to choose between the classical electronica compositions on the record, extensions on his work for the German theatrical version of War and Peace. ‘K&F Thema (Pizzicato)’ is plucked to a longing tune until the violin sweeps in to repaint everything, and is perhaps the most directly approachable track on the record. If there were ever a 2013 earworm particularly deserving of attention, it’s Dale Earnhardt Jr. Jr.’s intensely hummable ‘Dark Water’. The instantly recognizable whistled refrain that punctuates ominous pop sensibilities is only a quick reminder of exactly how smart this entire album, The Speed Of Things, really is. Give it a listen in its entirety and you won’t come away disappointed. In the mean time, this album shiner is up for free download on Soundcloud. New Zealand has seen a surge in talent in 2013, be it underage pop sensation Lorde or this year’s Booker winner Eleanor Catton. With this first single, Auckland duo Kittens Of The Internet hop on that bandwagon and establish themselves as more than just a clever band name – this sultry voice will stay in your head all day. Wally López – Follow Me! Everyone wants to take his photo at airports and clubs. He is responsible for “Just a Little More Love Wally López remix “, the remix that placed David Guetta on the map and ended up selling hundreds of thousands of copies. He’s best friends with the ex-footballer from Real Madrid, Jose Maria Gutierrez “Guti”. Wally López was a suburban kid, raised in the Madrid neighborhood of San Blas, who is now in demand in the DJ booths of the most important clubs in the world. He lives between Miami and Ibiza. This past August he released his first album “Follow me!” which has already been a great success and his Youtube views are now counted in millions. He is a true ‘electronic pop star’ working with voices like Jasmine Villegas (Justin Bieber’s Ex), Kreesha Turner and Jamie Scott (Graffiti 6). Wally spins in Ibiza’s most select and exclusive clubs, those that you can only enter by invitation or by knowing someone in the Ibiza night scene. 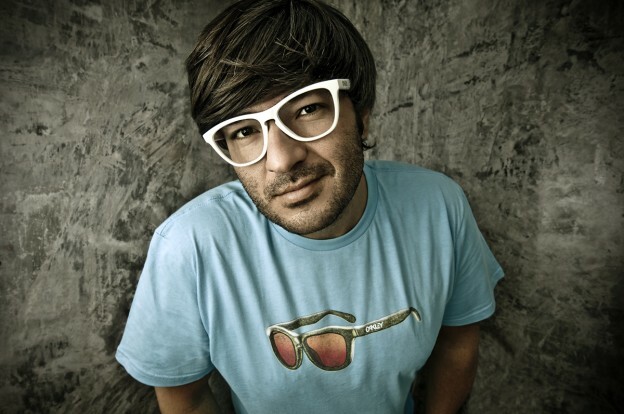 His name appears amongst the top DJ’s in the world and he is the only Spanish DJ to make 2 “essential remixes” on BBC1. Pursued by corporations and sponsors (Pioneer, Red Bull, Oakley …), Pepsi Spain see him as a “top” artist on the same level as sponsorships like Beyoncé in the US. He is an Idol on the radio airwaves with his ‘Maxima FM’ spot and a guru in the social media world. Wally López is one of the undisputed Spanish stars in the world of EDM. When did you decide that your life would be devoted to music? It all began as a hobby and when I saw my career as a pilot cut short by my short-sightedness I decided to go for music 100%. What inspired you to create “Follow me!”? Well, firstly it was due to the interest of EMI / Parlophone in supporting me if I embarked on this adventure….and the truth is that I was not inspired by anything in particular. I just wanted to bring my vision of contemporary pop to an album that would last in the memories of those who hear it. How did the Follow Me presentation go in Ibiza? Are you happy with how it was received? I always want more, but I’m happy seeing it was my first album. In Ibiza the presentation was absolutely brilliant. You have the advantage of having several major sponsors who rely on your talent. For example Pepsi, who has produced the single “Now is the time” with the vocals of Jasmine Villegas. How does it feel to work under such a big corporation? I don’t see it that way – for me they are part of the team, helping me to continue with my career. Pepsi are very supportive and I’m very happy about it. What collaborations can be found in this work? All kinds, but without a doubt my collaboration with Sister Bliss of Faithless I am extremely excited about, because of what it represents to me. Will there be a ‘Wally Lopez before’ and a ‘Wally Lopez after’ Follow Me? Yes and no (laughs). I think it’s another step in my career but I don’t think it will be a ‘before and after’. Given that you’ve remixed very important people in your career … What is the remix you still dream of? You’ve been around the world on more than one occasion, what have these experiences contributed to you musically and personally? Traveling has made me the person I am today, it has removed radical thoughts and made me focus my thoughts in a more comprehensive manner. Do you have any habits or rituals inside the DJ booth? I can’t DJ with a shirt, jumper or anything with long sleeves, and I normally remove my watch. You started in radio, The Eagles, Top Radio, LocaFM, Flash, Max Fm … What are your memories of these times, what has stayed with you? The truth is that all of my memories are positive and nice, I delete the bad ones and try to convert them to good! I’ve learnt a lot from all of these experiences and I am so glad to have had the opportunity of working for many years on the radio, which I love dearly. Everyone talks about you as a pioneer of House music in Spain, how do you feel about this statement and how do you see the current situation of House music? I’ve always said that I’m not pioneer of anything, but as I get older I do see some merit in my career and I hope that someday I will be recognized for this (laughing). To answer your second question, if I’m honest, I see the current situation of House quite poorly. In Ibiza you DJ in The Tower of Ushuaia, undoubtedly one of the most exclusive places on the island. What does Ibiza mean to you and what is so special about it? I also DJ in Lio and in Blue Marlin. These are the three top exclusive clubs on the island, no doubt. It gives me a new world and an audience that I’ve never had before. Ibiza is the max…. it took me in its arms and I reciprocate with infinite love! ☺ I hope my son grows up there and can enjoy the totally different life that is Ibiza …. Children from all around the world playing together, fantastic! You’re the owner of two record labels, a DJ school and Tremena, a T-shirt brand. How do you get the time to look after so many things? The truth is that without my team Factomania Group it would be totally impossible to cover everything and carry out all these projects. From here, I send all my thanks and respect to them. What is a typical day in the life of Wally Lopez? Lately I divide my hours between going to the gym, making music and enjoying time with my son. As from January I will start traveling again, non-stop. How would you describe yourself in just 5 words? Person … who … lives … a … dream. What does Wally Lopez have in mind for the future? Wally chose our #SundaySessions this week, click here for the playlist. It’s a known fact that we all love to laugh. It fights stress, increases energy levels, stabilizes blood pressure, boosts our immune systems and releases those feel-good endorphins. Though not everyones sense of humor is alike, one mans side-stitches can be another mans bore-fest. With that in mind, take a look at these comedy podcasts –the most popular amongst our users – you’re sure to find something to tickle your funny bone. Top of our users list is ”The Ricky Gervais Guide To…” with Stephen Merchant, award-winning writer and Karl Pilkington, plonker. You may recognize the trio from the famous, or, infamous documentary TV show ”An Idiot Abroad”, in which Ricky and Stephen send Karl off on extreme adventures around the globe, forcing him into situations completely outside of his comfort zone. The results are hilarious. The Ricky Gervais Guide to… is basically a reinvention of The Ricky Gervais Show – the world’s most downloaded podcast according to the Gusiness Book of Records. As of March 2011 the podcast had been downloaded 300 million times! The shows are available on iTunes and Audible.co.uk. Every episode is recorded live at Largo in LA. Jeff Garlin has an array of celebrity show-biz friends who are nice enough to endure the entirety of the show with him. The topics veer off to literally any random occurance that happened in either persons day, no topics are off limits. Seriously entertaining, and gives great insight into the celebrity guests’ thoughts and views, touching on subjects you’d never of thought to ask. How often do you get to have casual couch-chatter with a Hollywood A-lister? We do advise listeners to play them in small doses though, as Jeffs voice is the loudest and most heard throughout the alloted time. He can get annoying, but we think it’s totally worth the comedy gold. Creation 5 update – offline videos, movie player and more! 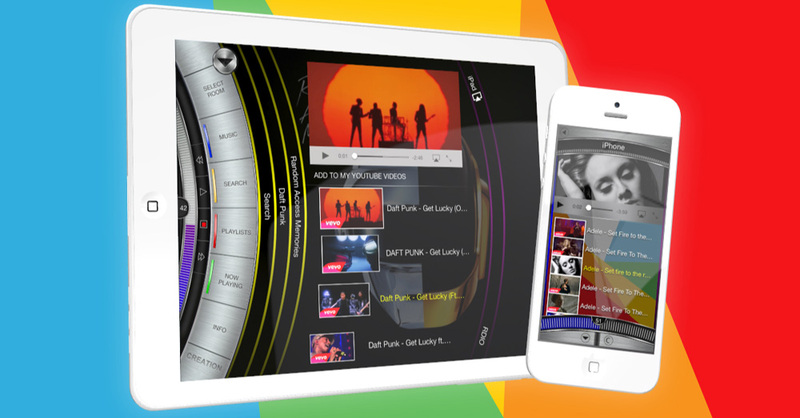 Video fans and Big Screen addicts will be delighted with the latest update to our chart-topping Creation 5 Media app. Creation has designed a new Movie Player – no more format or conversion issues, just press and play! Simply launch a video from Creation 5 and the Movie Player takes over from there, playing all popular video formats without any conversion, enabling hi-definition content to play on your Big Screen. Stream your content from DLNA network servers and enjoy the show! 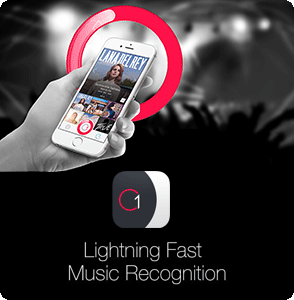 Support for Apple Airplay is also included. The Creation Movie Player is available free of charge to all users who have the Creation 5 Pro app and also for users who have downloaded the free app and subsequently purchased the DLNA feature. Like a video you’re watching on YouTube? Fancy keeping it in your collection? Creation 5 will allow you to do just that. Just hit download and it’s yours for keeps – watch it later offline, share it with your friends and start compiling some serious video playlists! Creation 5 is now available in Spanish – every button, every message, every note! This is the beginning of our plans to become a truly global app – we’ll start rolling out other languages in the coming weeks. Avanti! We’ve also done some houskeeping in this update and moved our popular hand picked playlists – Sunday Sessions, Throwback Thursdays and Tutti Frutti – into one main ‘Playlist’ section. Look out for lots of new playlists coming soon! Please update Creation 5 to this latest version! We can’t wait for you to try it and let us know what you think! Your continued support and feedback is invaluable. She’s fabulous, grandiose and oozing star quality. Sophie Gatward interviews singer, songwriter and TV Star Yanela Brooks, Cuba’s very own musical goddess. Yanela was born in Guantanamo (Cuba) in 1981. She was born into a musical family and started her piano career at the tender age of 7 at the Samuel Manuel’s Music Conservatory. At 15 years she joined the Art School in Cuba and specialized in Chorale Direction forming her own orchestra called “Yanela y las chicas del Sabor”. In 2000, Yanela decided to go solo and recorded her first LP “Tu Eres libre” with the French Record Company, Pastel Productions, which reached the top spot in the charts in the French islands. Subsequently, she was the protagonist of a musical along with Rafael Basurto Bolero, leader of ‘Los Panchos’, with whom she performed on some the best stages in Spain and was also in the Spanish feature film “Tango”. Yanela has now settled in Marbella and you can find her performing at any noteworthy event on the Costa del Sol, such as The Concordia Gala and The Davies Cup and has regular shows at the prestigious Kempinksi Hotel. Devoted to Blues, Soul, Rock and Smooth Jazz she has been baptized by her fans on the Costa del Sol as the ‘Diva of Disco and Soul’ and has won great acclaim for her energetic and compelling live performances. Your shows go on for hours, where does all that magical energy come from when you’re giving 110% all of the time whilst singing, dancing, playing the piano, mixing your music and getting the crowd going? Hahaha, thank you so much for the compliments. I do everything with passion, with my whole heart. I put my entire feelings into everything that I do. The energy comes from my love of work. Music and art are my passion. You come from a family of musicians. Tell us a bit more about this musical family of yours. I still remember my Grandfather when I was a child. He practiced on his trumpet everyday, and he would say to me as I watched him: ”Look girl, in life if you want to be the number one, you have to live for your profession. You have to dedicate completely in body and soul.” Those words have always stayed with me. Also my Mum is behind me, supporting me in everything that I do. My friends, my teachers, my boyfriend, a lot of people have been there, supporting me since the beginning. You once formed your own Orchestra ”Yanela y Las Chicas del Sabor”. Tell us some more about this and how it helped you get to where you are today. This time in my life was very important for me, because I had the opportunity to grow up as a composer, a pianist, a singer, a dancer and a business woman. But most importantly this was a time where I learned about life in general and the people in it. Anyone who knows anything about you, remembers you from the Spanish reality TV show ”La Voz” a show similar to X Factor and American Idol. Yes, it was an honor to be part of the first edition of ‘La Voz’ Spain. My Mum saw the advertisement on TV, and put me on the list without telling me! We both were number one fans of the TV show ‘The Voice’ – USA and I always said that if one day The Voice comes here to Spain, I wanna participate. Can you describe your experience throughout this time? Positives and negatives? My experience was wonderful, I never liked reality TV but I got hooked on The Voice from the beginning. Sure, little negative things happened while on the show, but I always prefer to stick with the positive. I’m proud to be part of ‘The Voices’ family. You now have a new CD out. What can people expect? Yes, we worked very hard on it and the results have been very exciting. People can expect a little of everything. Everybody who knows me and knows my show, knows that I love mixes: slow songs, fast rhythm to dance to, or emotional ballads to cry to. Several genres are included on the CD like soul, dance, rock, blues and jazz. I think you’ll like the whole CD. Where can we buy/download your music? Your single ”Mondays” featuring Brian Cross is a popular hit with a great music video to it. How did you and Brian come up with this song? What was the process? Working with Brian Cross was a GREAT privilege, the process was very easy, he’s very eccentric, like me, and we understand each other very well. We both always try to find perfection in everything we do. This is a big question – Your Hair! – WOW! It has a whole fan club of it’s own. What do you do to it!? It must be a huge effort to maintain. Hahaha, that makes me laugh, because it’s so true, wherever I go everybody always asks me the question, ”What about your Hair?!”. It’s part of my personality, and my movements on stage. I take a lot of care of my hair, I love it so much, and I’m telling you, I spend A LOT of time and money on it. Another big question – Your outfits! – another big WOW! With every show you dazzle the crowd with a different sparkly ensemble. Are there any stories behind them? Do you get them especially made for you? They are truly fantastic. I’m lucky that my Mum is a wonderful fashion designer. The best outfits that I have, are created by her. Also I have many talented friends and they make some of the outfits for my shows. Other than that I’ll get them from London, France, Spain or the USA. Final question, and most important – What can we expect in the future from Yanela Brooks? Let me tell you, there will be many surprises to come. Just wait and see. I only can say that I will always change my way of life with a positive passion, a wholesome truth, strong authenticity, unwavering energy, and most importantly: an undying HAPPINESS. Yanela chose our #SundaySessions this week, here’s the link to her smooth playlist: http://bit.ly/18FPWE2.